We sent Joey T., a young man and Auburn fan from Birmingham known for his twitticism, to cover Saturday’s Iron Flag Football Bowl charity event in Birmingham, which by all accounts was quite well organized and enjoyable. 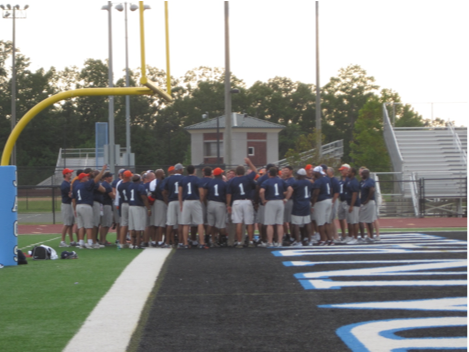 The Heart In Dixie Alumni Day Flag Football Game brought together more than 175 former Auburn and Alabama players for a flag football game at Spain Park High School in Hoover. The organizers raised money for The Governor’s Emergency Relief Fund which was set up to aid individual Alabamans recovering from April’s tornadoes. On the way to the game, I passed an area along the Cahaba River that still had downed trees from tornado damage. 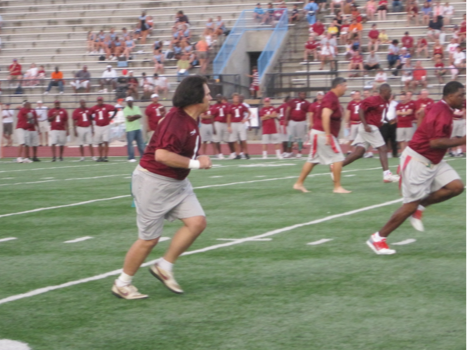 So I decided to bite my tongue, enjoy a friendly game alongside Alabama fans, and ultimately help a good cause. OK, so it will be harder than I initially thought. The former Alabama and Auburn players walked from the school onto the football field in a combined Tigers/Crimson Tide Walk. The only player I immediately recognized was former Auburn running back Bo Jackson. The rest of the players (go here for a complete roster) were hard to recognize and keep track of, even with a scorecard, for reasons that will become clear. 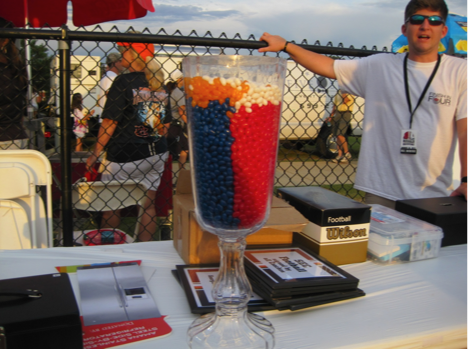 It was a laid back atmosphere with carnival games for the kids and jelly bean counting for the adults. My guess of 2,827 did not win. After a brief appearance by Gov. Bentley, the game started. I thought this former Alabama player had the best hair of anyone on the field (#1 below). The players all moved surprisingly well and clearly had a lot of competitive juice left in them. I was surprised at the speed. There were modified rules that resulted in both teams being able to score with ease. 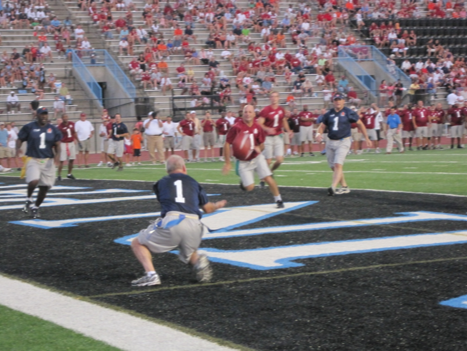 Here’s a photo of Auburn scoring a touchdown that gives a good indication of the level of defense being used. 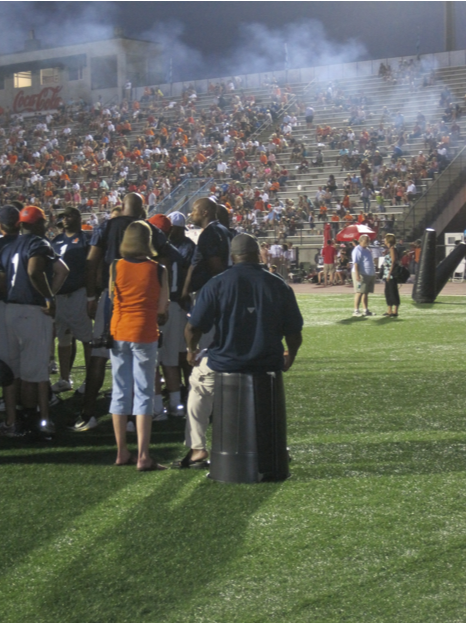 Here’s Bo Jackson sitting on a garbage can. Alabama ended up winning on a last minute catch by the only player who bothered to wear receiver gloves. He’s probably the type of guy who really gets into game night and ruins it for everyone. But he helped lead Alabama to a 42-41 victory and what will surely be counted a flag football national championship. The End. Re: the hair. I didn’t know Gene Simmons played football at Alabama. Anyone have any ideas about what is going on here? 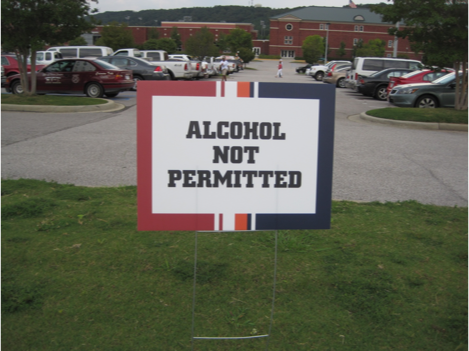 I read that they penalized Auburn for the QB moving “outside the pocket” (which I guess was one of the special rules… no roll outs or scrambles), but that on the winning two-point conversion, Andrew Zow did just that and… it wasn’t called. Bama getting friendly officiating? Color me unsurprised.